Vianey Gandaria holds a phone showing a music video her daughter, Evelyn Castellon, made while the two visit her doctor Wednesday, December 13, 2017, at Driscoll Children's Medical Plaza in McAllen. MISSION — Nine-year-old Evelyn Castellon spent her first Christmas in the operating room undergoing three separate surgeries, one of which would allow her to eat and breathe at the same time. Her mother Vianey Gandaria still can’t talk about it to this day without being overcome with emotion. “I’m a big crybaby,” she cautioned just moments before the knot in her throat kept her from speaking. Evelyn was born with Treacher Collins Syndrome, a rare genetic disease that alters the structure and development of the bones and tissue in her skull, her pediatric plastic surgeon Kevin Hopkins said. Evelyn Castellon, 9, listens to her physician, Dr. Kevin Hopkins, Wednesday, December 13, 2017, at Driscoll Children's Medical Plaza in McAllen. Castellon hopes to attend school in the spring. Hopkins, a specialist at the Craniofacial & Cleft Center at Driscoll Children’s Hospital in McAllen, believes it’s the same condition featured in the newly-released film titled Wonder. The movie highlights the struggles of young August Pullman, who looks physically different from his peers, as he enters fifth grade. Evelyn and her family are no strangers to the plight. The young girl has been home bound all her life and is just getting ready to enroll in second grade. But the move is causing some anxiety for her family, who is no stranger to the stares and questions people often have for Evelynn and her parents. Most children who are born with the condition tend to suffer from an array of facial disfigurements, Hopkins said. “The kids notoriously don’t have that cheekbone, and then they usually have small chins,” he pointing to the replica of a child’s skull. 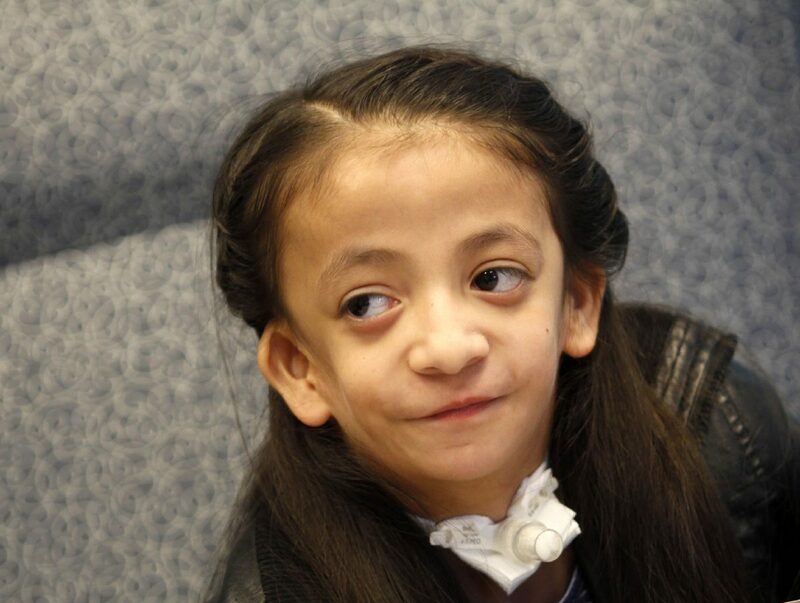 A lot of times they have hearing problems because they don’t have the external auditory canal and a majority of them, like Evelyn, need a tracheotomy. The nine-year-old was not immediately diagnosed with the condition, her lifelong-nurse Rosa Vazquez said. But doctors began paying attention after the newborn started turning purple while trying to eat. Shortly after being diagnosed, Evelyn had to undergo three surgeries at just three months old. On Christmas Eve 2008, surgeons worked on her heart. The following day, on Christmas, they gave her a tracheotomy to help her breath and inserted a G-tube to help her eat. “When she was small, it did look very grim,” her mother recalled before choking up again. And that will is still evident today. Evelyn comes off as timid at first, but she soon reveals her true colors. The lanky girl with waist-long hair does not hesitate to show others the self-made videos that feature her singing or imitating popular TV shows. Instead, she beams with pride as others watch her strut across her bedroom while holding what can only be considered a microphone. Latin heartthrob Maluma is her favorite artist now and she’s not so sure about liking Justin Bieber anymore. “She’s fascinated with life,” her mother said. And while Evelyn lives her days like any other child would, she can’t help but notice some differences. The self awareness began when she was about four years old, her mother remembered. But Evelyn’s learned to simply reply, “It helps me breath” — even when no one dares to ask. “She’s already surpassed it,” her mother said about her condition, though she still worries about the road ahead. Evelyn is over the moon about going to school, and she’s already being slowly introduced into a classroom setting. Every Friday, she goes to Americo Paredes Elementary to take an hour-long test. She’s already been introduced to students, and on Friday, she had lunch at school for the first time in her life. Accompanied by her younger brother, the nine-year-old seemed to enjoy a ham sandwich and a couple slices of orange. “It was good,” she said about her overall lunch experience, which included a trip to a sticker vending machine that dispensed a row of small anchors. 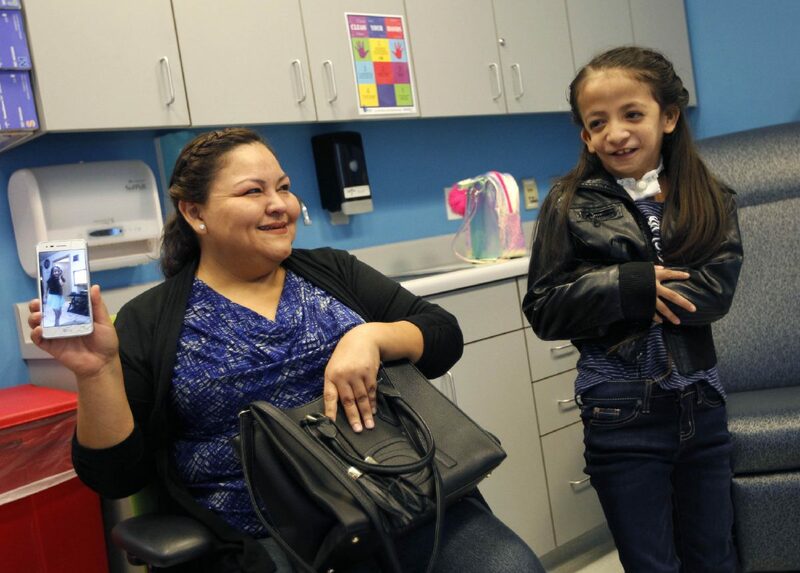 The La Loya school district is working with Evelyn’s parents and her doctors to come up with a curriculum and schedule for the second-grader. “We need to make certain that the personnel is up to date and very aware of how they’re going to be dealing with this child,” La Joya Counseling Director Myriam Tellez said. The school adheres to a year-round anti-bullying effort that includes wearing blue shirts on Mondays to raise awareness and a series of informal meetings between teachers and their classrooms. All of the district’s libraries are also circulating the book Wonder, on which the movie is based, she added. Hopkins will likely perform several surgeries for Evelyn in the near future, including the extension of her jaw. Evelyn has some cavities but dentists can’t fit instruments in her mouth, her mom said. He hopes to also work on her cheekbones, but the timing of each surgery must be planned based on her growth and development. Still, Evelyn can hardly hide her excitement at the thought of filling her cheeks. “I’m going to get cheeks with meat,” she often reminds her mother, who asks only that her daughter be given a chance at life without prejudice. Hopkins is willing to meet with teachers and students to help them understand Evelyn’s condition. “I think the more people know about what’s going on, the more they’re not going to pick her,” he said.